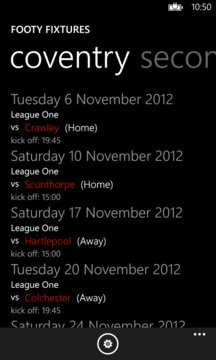 Footy Fixtures is an app that allows you to keep up to date on upcoming matches for your football team. 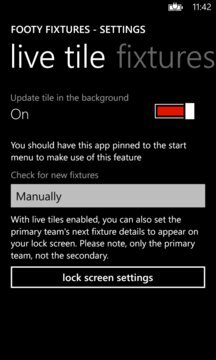 - Now supports the lock screen, so primary team's next fixture can be added to your lock screen. Reviews are great and we always welcome them. However, if you are having any issues with the app, before leaving a low rating, I urge you to contact me (see below) first as most issues can be resolved.